Neat right? 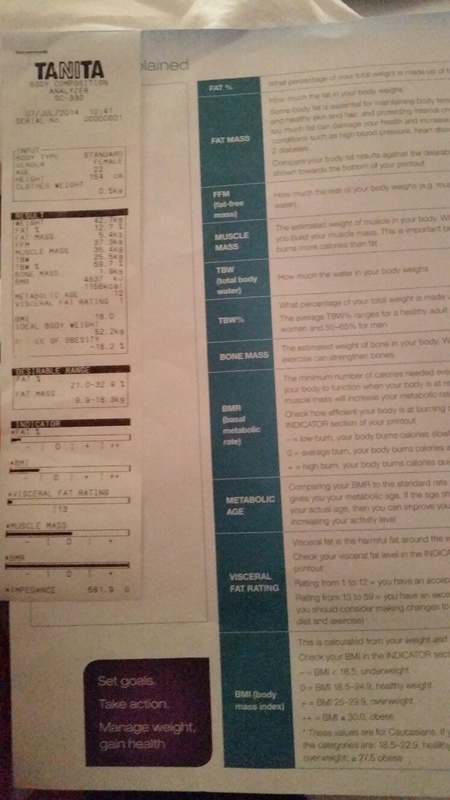 The receipt gives you a snapshot of your body composition and on the A4 paper it gives you a detailed explanation of the headings and what it means. I wish I had one at home! It’s so handy to know, because then it might give you what you should strive for, work on and improve on. But most importantly it educates you. I did not know that at my age and height I had a BMR of 4837KL/1156kcal… which is the amount of minimum calories I need everyday. Oh and I’m under-weight damn, I did not know and to be given the exact BMI will now help me to improve it so I can stay in the healthy weight.